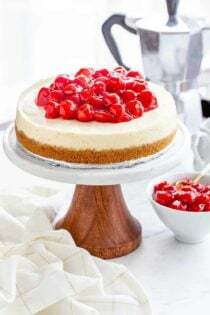 Today’s recipe is a really delicious spin on a traditional cheesecake, called a Hidden Berry Cream Cheese Torte. This dessert has a wonderful cookie crust topped with a velvety layer of cream cheese and cottage cheese. 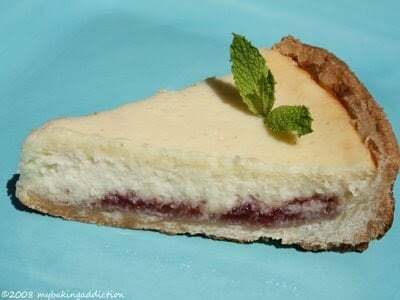 Once you slice into the torte you discover a lovely layer of berry preserves tucked underneath the cream cheese layer. The berry preserves provides a delectable amount of sweetness that balances this dessert perfectly. A food processor is sort of essential when bringing this dessert together and through the process, I discovered I need a larger one. Although the recipe requires multiple steps, it is quite easy and well worth the time. I will definitely make this again, but next time will add a little more preserves and probably experiment with the flavor I use. I found that this tasted best after sitting in the refrigerator overnight…giving the flavors a chance to develop. All in all, this Dorie Greenspan recipe was a hit with all that tasted it! If you do not have Dorie’s Book, Baking:From My Home to Yours, I highly suggest you check it out! This recipe can also be found by clicking here. Enjoy! This looks great! I’ve been wanting to go back and make this. Glad it tasted even better. I loved this when I made it and it just looks so pretty!